Since 1848 to 1880 the Royal standard was a white flag with a blue border. At the centre it bore the State Arms flanked by four tricolours. 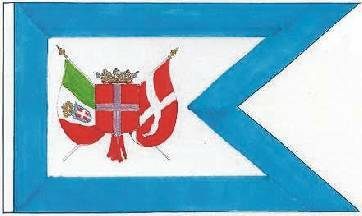 Source: Gino Galuppini, Franco Gay, "Insegne bandiere distintive e stemma della Marina in Italia", in Rivista Marittima, 1992. Since 1848 to 1880 the Royal princeps had a swallow tail version of it, but the arms had a princely crown, were of a simple form and there was one tricolour and one Savoy flag. Royal Standard: blue, in middle of a golden chain a crowned eagle bearing Savoy cross on breasts, in each corner a crown. Flaggenbuch shows a flag similar to Simon's image, with a few differences probably not too significant, except the shade of blue, which is much darker in Flaggenbuch (more or less similar to the shade used for British flags) and the lack of fringe around the flag. The same flag, but swallow-tailed, is shown in Flaggenbuch as Prince's Standard. Simon's image is incorrect. An imperial German 1892-1918 eagle combined with a 'generic' style of royal crown and a collar which does not show the 'FERT' acronym of the House of Savoy. The scan of the Royal Standard is more accurate. 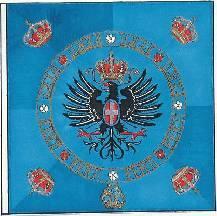 Royal Standard of the Crownprince of Italy from circa 1905 onward. 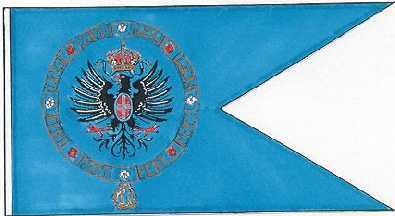 It is almost identical to those shown in Flaggenbuch 1939, except that here the shade of blue appears to be darker and the swallowtail of the Prince's flag has a right angle cut-out. 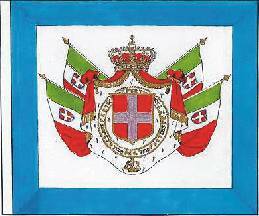 After 1880 until 1946 the standards were defined as for Royal Decree of 28 November 1880.The Gagliardetto dei Principi (ie Princeps Standard)was the same as the Standard of the King , but swallow tailed and without crowns in the corners.